There are some writers who have had a profound influence on me. Among my favorites are Alice Munro, Carol Shields (if you haven't read Larry's Party, you are missing a gem) and Margaret Laurence. Margaret Laurence had the most effect on how I saw the world. Perhaps that's because I read her novels at a particularly vulnerable time of life - as a teen and young adult woman. 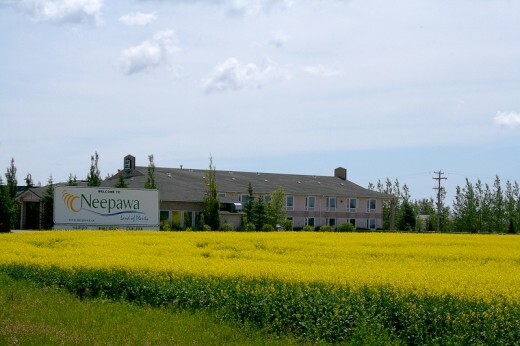 So it was with great pleasure and no small sense of awe that I stopped at the small town of Neepawa, Manitoba where she spent her early years. This is Manawaka - the setting for The Stone Angel, A Jest of God (upon which the film Rachel, Rachel was based), The Fire-Dwellers, and The Diviners. On the surface, it's a very ordinary farming community in rural Manitoba. Canola fields surround the town and fill the air with sweet fragrance. Sometimes wild seed escapes and fills the cracks in the highway pavement with sudden bursts of yellow. A Masonic sword graces the parlour wall. Elm trees line the streets and their embrace forms a kind of benevolent green gauntlet. Along one of these streets, First Avenue, is the childhood home of Margaret Laurence. It is now lovingly tended by the Margaret Laurence Home Committee, a dedicated group of people who are not only welcoming but very knowledgeable. She was born Jean Margaret Wemyss on July 18, 1926 to solicitor Robert Wemyss and his wife, Verna Jean Simpson. Margaret's mother died a few days after her fourth birthday. Her maternal aunt, Margaret Simpson, came to help care for the family and a year later, married Robert. He died five years later. 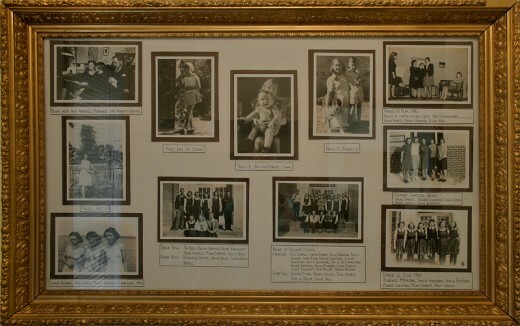 Little Margaret was raised by her aunt/stepmother and her maternal grandfather, John Simpson. My understanding is that he was a rather austere man of Scottish extraction. He was also a cabinetmaker and made the furniture in their front parlour. 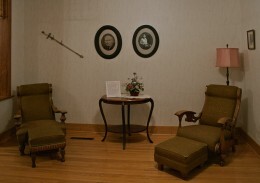 On the wall are portraits of her grandparents and her grandfather's Masonic sword. Despite the tragic and difficult circumstances of her early years, Margaret's writing flourished with the encouragement of her aunt and a high school English teacher, Ms. Musgrove. Upstairs is the room where she read and did her homework. Photographing it seemed somehow intrusive so I was content to read the names of the childhood novels on her bookshelf and imagine her curled up on the divan under the window. On the wall is a collection of personal photographs from her early years. In 1947, she graduated from Winnipeg United College (now the University of Winnipeg) and began work as a reporter for a local newspaper covering labour news and doing book reviews. She married an engineer, John Laurence, whose job took them to England in 1949 and then to Africa; Somaliland until 1952 and then Ghana until shortly before its independence in 1957. The family left Africa with their two children and moved to Vancouver, Canada where they lived until their separation in 1962. She had begun writing short stories during these years, as did her husband, but she continued to expand on her writing after their separation. She moved to London, England for a year and then to Elm Cottage in Buckinghamshire where she lived for the next decade. This was a very prolific period in her writing career. Her divorce became final in 1969. 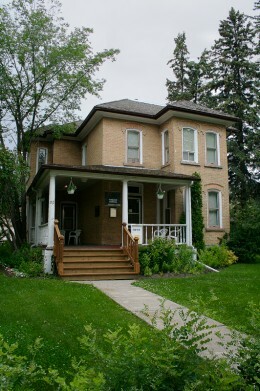 Upon her return to Canada, she became writer-in-residence at the University of Toronto and a short time later, moved to Lakefield, Ontario. She purchased a cabin on the Otonabee River where she was able to relax in the rural quiet and beauty of her surroundings. It was here that she wrote The Diviners over the summers of 1971 to 1973. The book was published in 1974 and won the Governor General's award. It became part of the reading curriculum in many Canadian high schools but not without some controversy. It was banned for a while in Laurence's own town of Lakefield! In the last decade of her life, Margaret Laurence became actively involved with environmental concerns, nuclear disarmament, literacy and many other social issues she felt would make the world a better place for people of all nations. She was deeply committed to these causes and won many prestigious awards for her efforts. She has left a powerful legacy. A short distance away in the northeast corner of Neepawa is the Riverside Cemetery. Here you will find the stone angel - the one that inspired the book of the same name, the first of the 'Manawaka' novels. In 1986 she was diagnosed with late stage lung cancer and on January 5, 1987, Margaret Laurence slipped from this earth on her own terms. 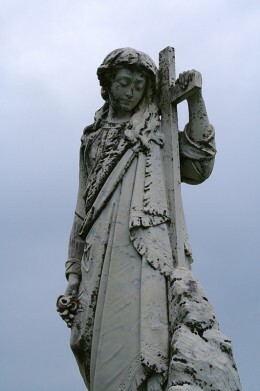 Her ashes are interred only steps away from the stone angel. Thank you to the Margaret Laurence Home Committee for their ongoing efforts to maintain this historical tribute and to the Laurence family for sharing many of the personal items found in the museum. © Alexandra Lucas 2010. All Rights Reserved. All photos are provided with permission by SilverGenes on Flickr. Please contact for permission to reproduce any portion of this article. Read a review of Margaret Laurence's The Stone Angel. If you type the name Mordecai Richler into a search bar, you will get results as varied as the literature he penned and no small indication of controversy. What you will not find are courses featuring his work being taught in Canadian schools. Why?